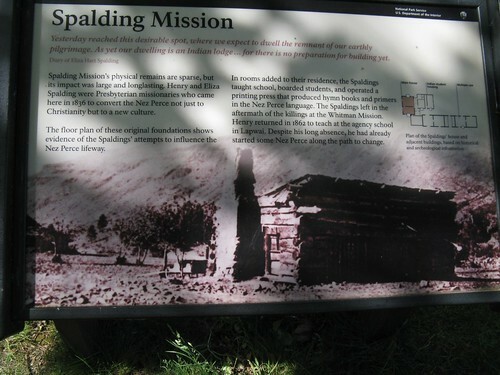 Marcus Whitman and Henry Harmon Spalding led Presbyterian missionaries west in 1836 to answer a Nez Perce call for teachers. According to a Nex Perce Indian legend, the stone arch up the hill was once two fighting insects named Ant and Yellowjacket. Ant and Yellowjacket had a argument and came to blows over who had the right to eat dried salmon here. Fighting fiercely, they failed to notice Coyote, the all-powerful animal spirit. Even when he ordered them to stop, Ant and Yellowjacket kept on struggling. For not heeding his warning, he turned them to stone while their backs were arched and their jaws locked together in combat. (In my opinion, I think it might be what's left of a cave made of basalt, but who am I to mess with an American Indian legend. After all, they were here many moons before you and I.) I am sure that Ant and Yellowjacket won't mind my opinions. I found this story and just had to post it here in hopes that everyone who reads it will get a good laugh and have a brighter day because of it. I know it really made my day. The story goes as follows: There's a lovely story (most likely apocryphal) about two London cockney treasure hunters, let's call 'em Bill and Charlie, who ventured into the grounds of one of England's more splendid Georgian country mansions, in the vain hope of gaining permission to hunt, while trying to project a good image for themselves, and the hobby. Finding themselves on the manicured front lawn of the stately house, were immediately seized upon by a small terrier dog making several attacking and yapping passes at their trouser legs. Amidst the commotion, an upstairs window opened. It was the lady of the house, inquiring as to their business. Oro Fino City was the commercial center of Idaho's earliest gold camp in the great days of 1861. It flourished here for more than a year. Pierce City was only two miles away, but another town sprang up near some rich gold strikes. In its first few weeks, Oro Fino City had "about 90 houses – more going up every day; nine or 10 stores, more saloons than are needed, two smith shops, two butcher shops, three families, and about 500 inhabitants." But with the gold rush over, the place was abandoned. The deserted town burned to the ground, August 10, 1867. The picture was taken at the Orofino Fourth of July parade in 1900. The mining camp Oro Fino was founded about forty miles north of the present city of Orofino. In 1861 Oro Fino had six restaurants, two hotels, 20 whiskey shops, 10 gambling saloons, two bakeries, one watchmaker, one bookstore, one barbershop and three doctors' offices. If you would like to see other postings regarding historical markers go to Idaho Historical Markers. The Idaho Treasure Hunters Forum is now up and running! Several categories and forums have been created with more to come as they are needed. If you have a category or forum suggestion let us know. We will consider your request and let you know if we add it to our site. You must register at Idaho Treasure Hunters to comment or add a forum topic. Every comment or topic created in the forum each month will earn you one entry in the monthly drawing. You can still gain a daily entry by filling in your info on the "Contact Us" page, and five entries by finding the gold coin each day. You can upload an Avatar, make friend requests, view our membership directory, and more, so make sure you register.